Located on the southwestern side of Paine Mountain, the Norwich University ski area served students and regional skiers for over half a century. Norwich University was founded in 1819 as the The American Literary, Scientific, and Military Academy. After multiple relocations (including Middletown, Connecticut, and Norwich, Vermont), the school finally settled in Northfield, Vermont in 1866. Lift served skiing in Northfield likely dates back to 1936, when the Northfield Ski Club installed an electric rope tow on South Main Street near Norwich University. Three years later, William Lybrand purchased the rope tow for the university. Lybrand donated additional funds in 1954 to develop additional alpine skiing terrain. In his honor, the ski area was named Lybrand Ski Area. Big changes took place in 1961, when an expansion took place on land transferred to the university by George Goodrich. A new hut was added that season, and the ski area subsequently renamed Goodrich Ski Area. A new 1,500 foot long Poma lift was installed from the base of the ski area for the 1962-63 season. A rope tow was then either relocated to above the Poma lift or else to a novice slope nearby. The largest expansion took place for the 1970-71 season, when a new Hall double chairlift was installed, providing continuous lift service for the 900 vertical foot ski area. The expanded area was billed as perhaps the largest on-campus ski area in the country, a feature that attracted many new students to the university in subsequent years. Also at this time, the area was opened to the general public. While it was a decent sized ski area, it failed to gain much large scale use. After half a decade of being open to the public, still less than 5 percent of skiers came from out of state. In addition, its status as a non-snowmaking mountain meant that lean years on the 1970s and 1980s were especially painful. Not wanting to invest hundreds of thousands of dollars in a snowmaking system, the university looked into leasing the operation. Following the 1991-92 season, the university closed the ski area. Circa 1993, the double chairlift was sold to Pats Peak in New Hampshire, where it was eventually installed as the Vortex Double. In 2010, Norwich alum Larry Costa donated $1.4 million to the school in the memory of classmate Sgt. 1st Class John Shaw to develop the Norwich University SFC John Shaw Outdoor Center. 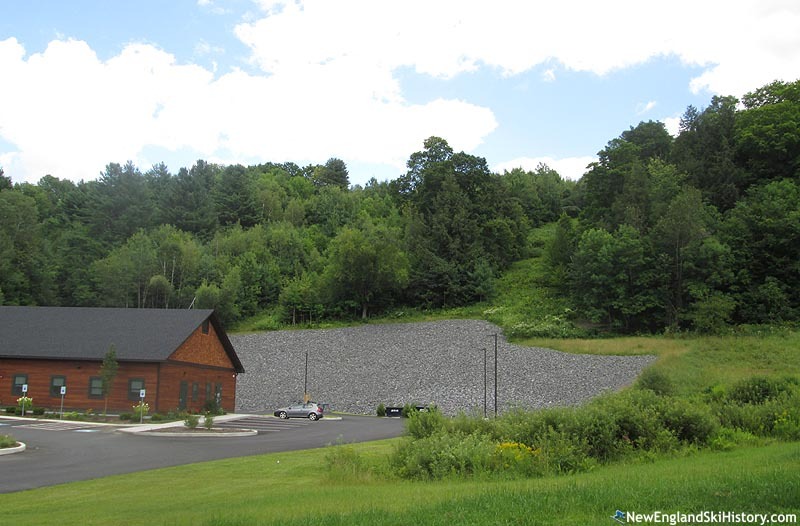 The first phase of the project included a network of multi-use trails in the vicinity of the old ski area for marching, hiking, mountain biking, sledding, snowshoeing, and nordic skiing. A small terrain park may be constructed in a future phase. "After growing up with the ski area almost in my back yard, I went to Norwich for my undergraduate degree and was fortunate enough to be the Ski Patrol Leader there for 5 seasons during the "hay days" 1972-1977. I will always remember it as a very special time in a special place and frequently recount any number of stories and great times shared by all. Shout out to all my former ski patrol friends!" "I believe the area included (or at least was adjacent to) a jump that was used for intercollegiate competition, as I recall jumping there in 1966 or 1967."